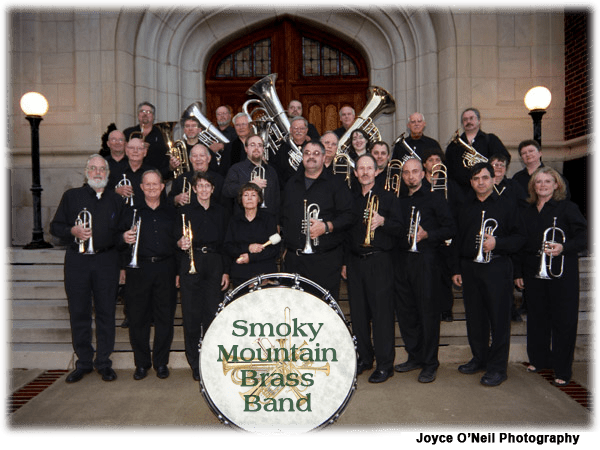 This Sunday, June 2, 2013, I’ll be conducting the Smoky Mountain Brass Band in concert at Hazelwood Baptist Church in Waynesville, NC at 5 PM. This is a free performance. If you missed our concert last April 28th, we’re going to be performing some of that music again, including Brass Metamorphosis by James Curnow and Eric Whitacre’s Sleep, arranged by one of our cornet players, Peter Voisin. We’ll also be playing some new music, including an arrangement of music from the soundtrack to Jurasic Park, the U.S. Navy hymn, Eternal Father Strong to Save, and an arrangement of 76 Trombones from the musical, The Music Man. This is a free concert, although a goodwill offering will be collected. If you’re in western NC this weekend and looking for some live music to listen to, come on out and hear the best (and only) British style brass band in the area. I’ve recently begun playing with the Low-Down Sires, a dixieland group based out of Asheville, NC. I have always enjoyed playing dixieland, although I hadn’t been playing a whole lot of it lately, so it’s a lot of fun to be playing it again regularly. One of the things I really appreciate about this group is that everyone makes a serious effort to play in the style. There’s nothing worse than listening to players who don’t play stylistically correct, regardless of what genre of music they’re performing. One of the tunes we’ve been playing that’s been giving me some trouble is Jelly Roll Morton’s King Porter Stomp. This tune is challenging for me to solo over, in part because of the changes (it starts on the IV chord, not rare but somewhat unusual), key (Ab major, not too hairy, but a little tricky if I’m not focused), and bright tempo. Taken together, it’s not usually a big deal for me to adjust to these changes and tempo, but I keep finding myself wanting to bop over it. In order to give me some ideas for a more stylistically correct approach I decided to transcribe Lou McGarity’s solo over this tune and get inside it a bit. There’s a couple of things in it I find interesting. McGarity uses a lot of Ab major pentatonic over it, but with some added passing tones between the 5th (Eb) and 6th (F) as well as a lower neighbor passing tone to the 3rd (C). Here’s an example from the first 4 measures of his solo. The Ab major pentatonic scale (Ab, Bb, C, Eb, and F) provides a nice sound to blanket over this chord sequence (which makes up most of the solo changes). The chromatic passing tones (E/Fb and B/Cb) give it a little more color without sounding to bopish in the dixieland style. McGarity recorded this solo in 1951, quite a while after the tailgate trombone style evolved, but he plays some of the typical glisses and long notes in this solo. Somewhat unusually, he also shows off his solid upper register by screaming a high Eb in this solo. Here’s an example from last 8 measures of the second chorus. If you’d like to see the whole transcription, you can use this link. As I always like to recommend, you shouldn’t trust my transcription for complete accuracy. For one thing, I’ve only approximated some of the glisses and smears McGarity plays. If you don’t really listen closely to the sound you’re going and try to learn this solo you’re going to miss a huge part of the style. Here’s a YouTube video I found of this recording, but be aware that the sound was sped up so that it is playing back a half step higher. You can buy this track here. A recent topic on the Trumpet Herald Forum reminded me of the below video of Allen Vizzutti playing some extremely impressive double tongued octaves. Check it out. What I wanted to comment on here is Vizzutti’s noticeable horn angle changes as he changes octaves. You can clearly see that as he ascends he brings the bell of his horn down slightly and to his left and does the reverse to descend. It seems like a lot of motion, but considering the overall range he’s playing it’s really not all that much change. This change isn’t quite so noticeable when he’s playing music that doesn’t have such large interval leaps. In the below video you can see some good shots of him not only playing large interval changes but also playing phrases where his horn angle changes aren’t that noticeable. It’s worth noting here that the specific angle changes Vizzutti is making here aren’t going to be the same for all players. Many players, myself included, find that bringing your jaw slightly forward and angle slightly up works best to ascend. Some players may find the general direction of the horn angle change to be more or less straight up and down while many players will find some angular deviation, like Vizzutti’s. The important part here is that it moves pretty much in a straight line and more or less the same amount between octaves. What works for one player isn’t going to be the same for another, and what works for a single individual can also change over time as the player develops. I’d also like to point out that while many (perhaps most) brass players look at these horn angle changes and call this a “pivot,” this is not what Donald Reinhardt, who coined the term, meant by it. Reinhardt used this term to refer to the way that players will slide the mouthpiece and lips together as a single unit up and down along the teeth and gums to change registers. I prefer to use Doug Elliott’s term “embouchure motion” instead, because it’s less likely to be confused. Two players with the same direction of embouchure motion may end up making the opposite changes in horn angle. It can be very personal to the player and isn’t an easy thing to generalize. 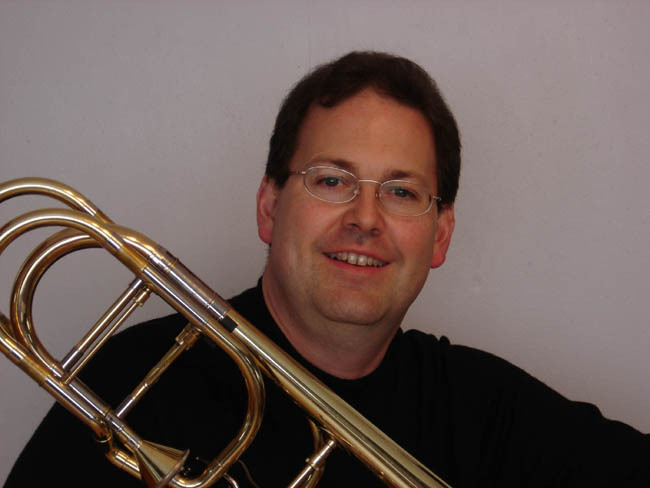 A short while ago I got an email from Rusty McKinney, formerly the bass trombonist with the Utah Symphony. Rusty is one of the examples of an upstream orchestral player I mentioned in my article about five common embouchure misconceptions, specifically referring to the myth that all players need to place the mouthpiece centered or with more top lip inside the mouthpiece. Rusty has a low placement and plays quite well with it! He gave me permission to quote our email exchange and so here are some of the things he mentioned to me, with a few of my thoughts scattered between. I ran across your site and saw that you mentioned me in your upstream are in “Myths ” section. I often make the upstream list and am intrigued and slightly amused that it is usually me and jazz artists! Like Rusty, I too find it interesting that most of the upstream players that we know about are jazz players. It’s definitely true that downstream players are more common, not because of any inherent advantage but because more players don’t have the anatomical features that make upstream players work best. I also feel that because teachers have a tendency to teach what worked for them personally that many upstream players are taught to move their mouthpiece higher on the lips and are forced into a downstream embouchure inadvertently. These players will typically struggle and either never reach their full potential or give up brass playing altogether. Because jazz players are more likely to be self taught and classical players tend to go through formal music education (particularly in conservatories, where tradition is strong) this tends to weed out upstream players in favor of downstream players. Anyway, I wanted to let you know that I am more in your neighborhood than I used to be. I left the Utah Symphony about two years ago to switch my emphasis to being a church music director and as such I am now fulltime at White Plains United Methodist Church in Cary, NC. I am still playing regularly, often subbing in the NC symphony, and playing for NC Opera and various orchestras that are put together for Duke Chapel. And I have given master classes this past Spring at UNC Chapel Hill for Mike Chris’ Studio and at UNCSA for John Ilika’s studio. Hope we can connect sometime. My upstream embouchure still works just fine! One of the common arguments I hear from downstream teachers who discourage the low mouthpiece placement that is what makes an upstream embouchure is that it will eventually break down. Rusty is a perfect example of how an upstream embouchure can function very well long term, when the player learns to work with his or her natural tendencies. Too many folks dismiss the embouchure and that is a bad thing. I would have been ruined by well meaning teachers had I not been so bull headed. And been lucky to find folks along the way like Doug [Elliot] who either understood how the upstreamer functions or as with others who didn’t care how I did it, as long as I got good results and had endurance. One of the funniest moments was when I was in Jr. High and my teacher, a respected ( and rightfully so ) college professor had me play for a visiting artist from Las Vegas. He had a few suggestions about improving my legato but said nothing about my embouchure. When my teacher started pointing out all the things that were “wrong” with my set-up the clinician said, “Hey man, if you can get a sound like that you could stick the mouthpiece in your ear for all I care!” It was pretty funny. My teacher wasn’t especially amused. Great story. Thanks to Rusty for stopping by and allowing me to post his emails. I’m excited that he’s now so close to where I am (Asheville, NC) and the next time I make it out east towards him I hope that we’ll be able to hook up and share some upstream embouchure stories. My own upstream embouchure is still working fine too! I will be performing dixieland this weekend, Saturday May 18, 2013 over in Charleston, SC for the Charleston Lindy Exchange. For details about this show visit their schedule. The band is the Low-Down Sires, a group dedicated to recreating the music of early jazz from New Orleans and Chicago. We perform music that was recorded by Louis Armstrong, Kid Ory, Jelly Roll Morton, Wild Bill Davidson, and others from that period. It’s really a fun group to play with. Everyone is devoted to playing the music stylistically correct, which isn’t all that easy to do when you’re used to playing bop styles. If you’re around Charleston tomorrow and like dancing come on out. Here’s a neat YouTube video discussing the science behind why we think music elicits an emotional response in us. Daniel J. Levitin’s book, This Is Your Brain On Music, has some similar discussion that I recommend if you want to learn more.